Growth in China’s vast manufacturing sector stalled for the first time in over two years in November as new orders shrank, adding pressure on Beijing ahead of high-stakes trade talks between presidents Xi Jinping and Donald Trump this weekend. The official Purchasing Managers’ Index (PMI), released on Friday, fell to 50 in November, missing market expectations and down from 50.2 in October. The 50-point mark is considered neutral territory, indicating no growth in activity or contraction on a monthly basis. Analysts surveyed by Reuters had forecast the official gauge would hold steady from October’s low level, suggesting marginal growth. The downbeat reading on China’s factory activity came a day ahead of a closely watched dinner meeting between Trump and Xi on the sidelines of a G-20 summit in Buenos Aires, their first meeting since the two nations began imposing tariffs on each other’s goods earlier this year. But few market watchers expect a major breakthrough in the trade dispute, as neither side has indicated any intention of making major concessions. The Trump administration has pointed to growing signs of economic weakness in China and its slumping stock markets as proof that the United States is winning the trade war. White House economic adviser Larry Kudlow said on Tuesday that Trump is ready to hike tariffs and could add duties on another $267 billion of Chinese imports if there is no breakthrough in the meeting. 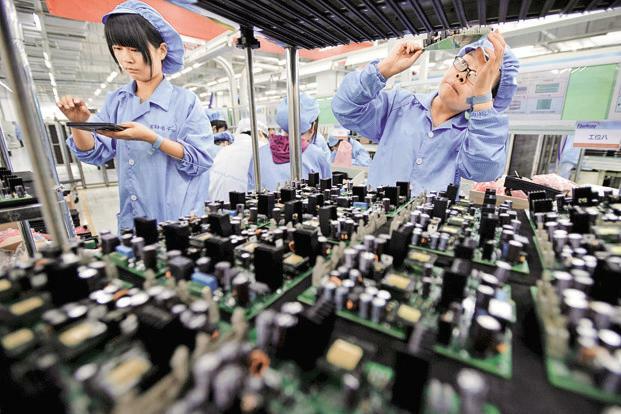 The China PMI survey showed further weakness in new orders from at home and abroad. The production sub-index fell to 51.9 in November from 52 in October, while a new orders sub-index — an indicator of future activity — declined to 50.4 from 50.8. New export orders shrank for a sixth straight month. The sub-index rose marginally to 47 from 46.9 in October. Chinese manufacturers’ import orders also shrank, falling to 47.1 from 47.6 in October and reflecting weakening domestic demand. China’s exports have been surprisingly resilient so far this year as shippers rush out goods to beat U.S. tariffs, but orders have been slumping for months, raising the risk of a sharp drop soon if the U.S. raises tariffs as planned on Jan. 1. Another sister survey released by the NBS on Friday showed growth in China’s service sector moderated in November, but remained at solid levels. The official non-manufacturing Purchasing Managers’ Index (PMI) dipped to 53.4 from 53.9 the previous month.